Transmission electron micrograph of an unbudded yeast cell treated with 60µM sertraline. Two autophagosomes containing membranous material are visible. 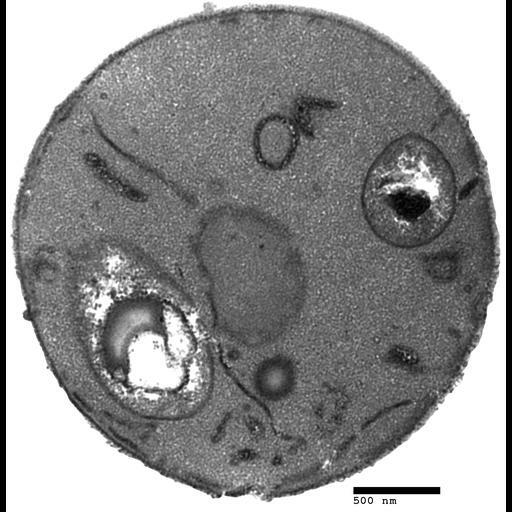 Higher magnification images of ultrastructural features are available as CIL:39709, 39710, 40305, and 40306. BY4716 is an auxotrophic haploid laboratory strain of the budding yeast Saccharomyces cerevisiae. Its genotype is lys2Δ, mating type alpha and it is derived from S288c. Sections were embedded in LR white resin, mounted on carbon-coated nickel grids and imaged with LEO 912AB at 80kV and 6,300X. All cells in this batch were grown in liquid rich media (YPD pH6.5) at 30˚C with aerated shaking, and cultures were sampled in mid-logarithmic phase. This image is part of a group of untreated cells and cells exposed to 60µM antidepressant sertraline (Zoloft®) for 45 minutes.